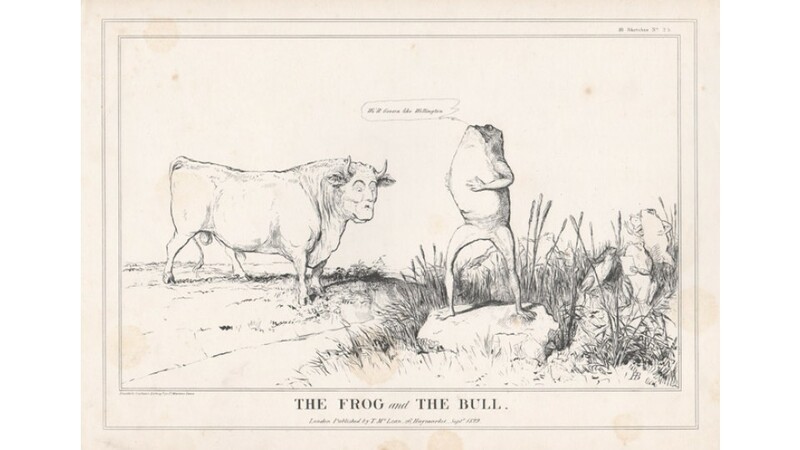 English 1830s political cartoon by 'HB' Doyle. 'This sketch is a further illustration of the idea which forms the subject of No.XXIV. ; that Prince Polignac, in his government of France, took the administration of the Duke of Wellington, in England, as his model. 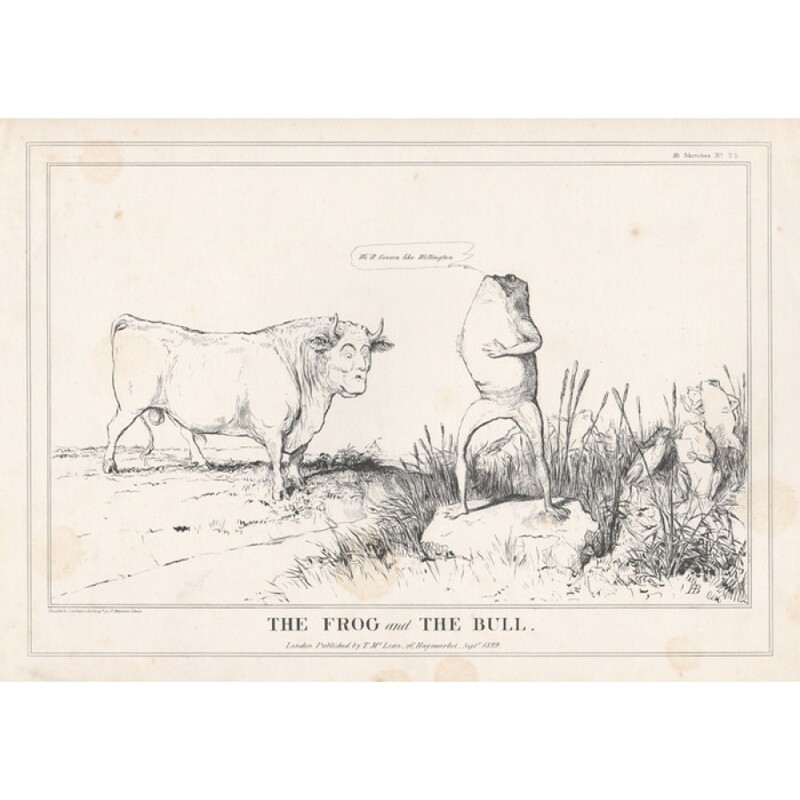 The sketch has a double application : the fable of the frog, that burst herself in her endeavours to swell her size so as to equal that of the ox, is universally known ; and the comparison of Frenchmen to frogs, and Englishmen to bulls, is almost as familiar.' Ref : 'An illustrative key to the Political sketches of H.B.,from no. 1 to no. 600." Depicts Arthur Wellesley, 1st Duke of Wellington (1769-1852) and Jules Auguste Armand Marie, Prince de Polignac (1780-1847), French statesman. John Doyle (1797 - 1868), known by the pen name H.B., was an Irish-born political cartoonist, caricaturist, painter and lithographer. 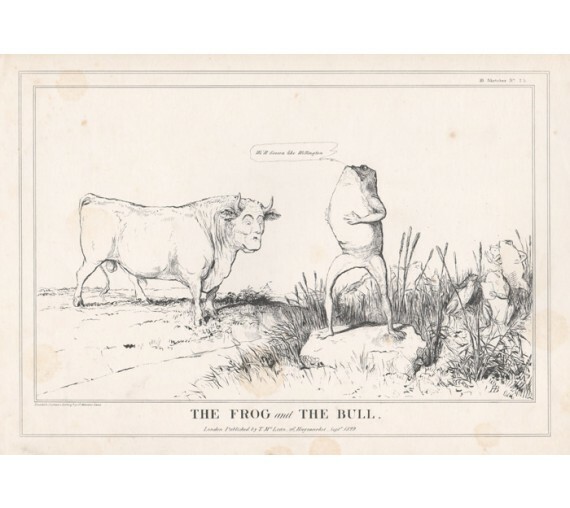 He issued his popular political cartoons once a month during parliamentary sessions, and continued for twenty-two years. Attached at at corners to brown backing paper, as issued. Some foxing.